After creating my first cloud out of 49 circles (all the same size) i figured out that it would take a looooooooong time to complete these clouds. And so i tried a different approach by creating a spreadsheet where i „only“ have to fill in the x,y coordinates of the shapes and it creates the resulting sourcecode out of it so that i could copy and paste it to my netbeans project. That was not too bad but not the solution i was looking for and so i checked all possibilities to export a Adobe Fireworks png file to a format which i could read and convert with Java. 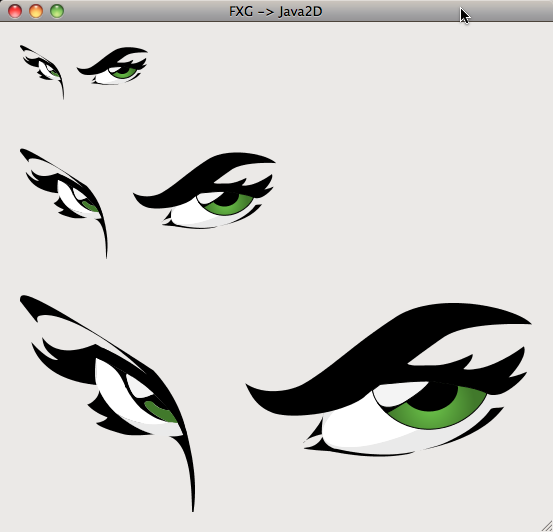 And i found it…it’s called FXG and is similar to SVG but was created from Adobe to exchange images within the Adobe CS4 suite. 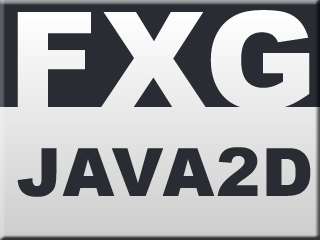 When i took a look at the exported fxg file (which is a xml dialect) i found out that it should not be too hard to write a quick and dirty converter that will help me get the shape coordinates from the fxg file into the Java2D sourcecode. So i started with converting only the coordinates but that was fun and so i continued to convert also gradients, strokes, text etc. In the meantime Adobe announced the CS5 suite which will make use of the FXG 2.0 standard and i hope my converter will be able to handle this too (if not i’ll make it possible). Well right now this is NOT a full blown converter but a little tool (unfortunately still a quick and dirty solution) that helps me converting my design prototypes from Adobe Fireworks into Java2d sourcecode. 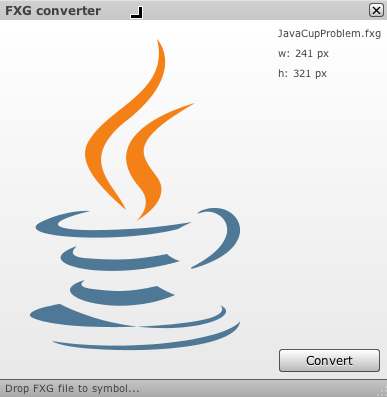 I kept a hint of Dave Gilbert (subscribe to his blog) in my mind who told me to keep things scalable and for this reason (thanx Dave) i created the converter in the way that it converts all vector shapes to scalable Java2D shapes. This means you could take a big image like i did in this example (809 px width) and the conversion will create a method that creates a buffered image where you could define the width (and the height will be calculated properly so that you keep the right aspect ratio). 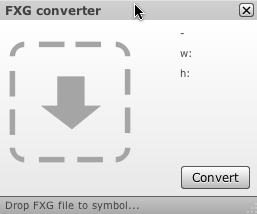 If you now press the convert button the FxgConverter will convert the fxg data into java2d code and copy the code to the clipboard. Additional to that it will create a java file on your desktop which contains the sourcecode. As you could see the last row will contain the code which draws the image, just copy this row and paste it into your painting code (e.g. paintComponent method). If you name the elements in Fireworks the converter will name the shapes in the sourcecode with the same name (keep in mind that you do not use the same name twice). It’s not needed to give each element a name but in complex designs it makes things easier, especialy if you would like to make changes to it later in the sourcecode. Thanx to Rémy Rakic (find him here on twitter or subscribe to his blog) i got some fxg files that have been converted by Adobe Illustrator. Unfortunately the fxg format from Illustrator is different from the Fireworks fxg format and so i had to rework parts of the converter. 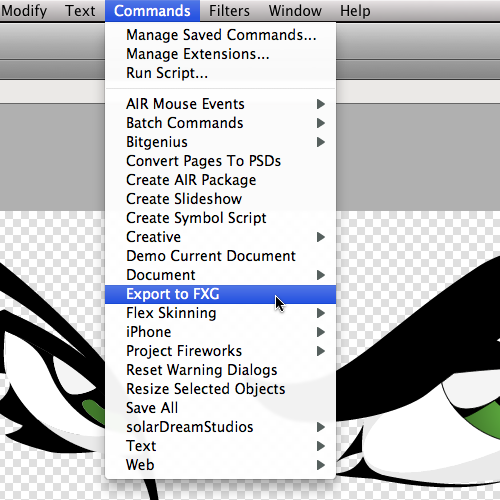 To get the best results you should ungroup all elements in Fireworks before you export them to fxg. 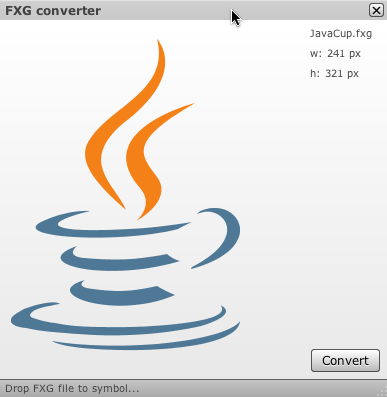 For me the most important thing was to get the shapes from my Adobe Fireworks files into Java2D code to make the creation of custom java swing components more easy the converter won’t make use of bitmaps that are linked to the fxg file etc. It will only convert (hopefully) all kinds of shapes with their filling and strokes to java2d code. In the Netbeans project you will find two converters, one will create a buffered image on the fly (this was needed for the preview) and the other will copy the sourcecode to the clipboard and save it as a java file. In Java a single method is not allowed to be larger than 64 kb !!! You might think that you will never reach this size but when it comes to complex vectorgraphics it’s not a big deal to create single method with more than 10000 lines of code !!! I just use a simple trick to avoid methods that large by splitting them up into methods of 1000 lines of code. 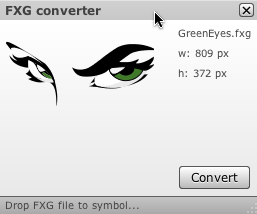 So if you have a very large fxg file to convert you might find multiple versions of the image creating method (in the example above it would look like createGreenEyesImage(int width, createGreenEyesImage1(int width), etc.). Unfortunately i still found images that will blow up my code and it won’t work but for smaller fxg designs it works ok. It seems to be a problem if you have a path that was made of only a few cubic splines, if you add some more points, it will convert fine. I did not found the time to take a closer look to the problem. I hope that with Adobe’s CS5 the fxg export in Illustrator and Fireworks will lead to the same result, please keep in mind that this is still not finished yet and whenever i find some time i try to improve the conversion.